We own and manage a number of car parks throughout the district. Car parks in the villages are FREE: small car parks which are free of charge. Town parking in Ashby and Coalville is pay and display. From this page you can find information and links to parking in North West Leicestershire - including the location of car parks, and charges. You can also buy a car parking season ticket if you need to park regularly. Remember - it's free to park after 3pm in Coalville! Leicestershire County Council is the Highway Authority and is responsible for on-street parking. The district council's Civil Enforcement Officers enforce the restrictions on behalf of the county. Parking regulations include illegal parking on single and double yellow lines, disabled parking bays, and in bus stops and taxi ranks. Find out more about how to get to and around North West Leicestershire. Can Belvoir Shopping Centre shop workers in Coalville have a parking season ticket? Yes - season tickets are available at a discounted rate. An agreement with the shopping centre owners and us allows for a number of free car parking spaces on the Market Hall Car Park. Can town centre residents obtain a season ticket to park in public car parks? Yes - season tickets are available at discounted prices which residents may purchase. There are no charges after 5pm. Which car parks do charges apply to? 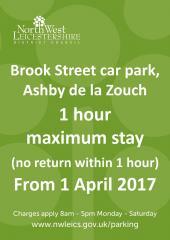 All public car parks in Coalville and Ashby plus some private car parks including the Royal Hotel car park in Ashby. Will disabled drivers have to pay car parking charges? Blue Badge holders are exempt from charges. Will visitors to the council offices have to pay to park? Official visitors to our office are able to park free of charge for up to half an hour. There are a number of bays to accommodate this. If their business at the council is likely to take longer than these visitors must pay and display.